What is your background in the zoo business and how did you first come to be involved with Blackpool Zoo? I have worked in the Zoological industry for 27 years starting as a trainee keeper with the Great Apes at Bristol Zoo at the tender age of 16. I spent 10 very enjoyable years getting a good grounding in the role of zoos and animal keeping before I left for pastures new, eventually ending up a short time later at Blackpool Zoo as a seasonal keeper on a temporary contract (17 years later I am still here!). My time at Blackpool Zoo has given me a great opportunity to get involved in all aspects of the zoological industry, working with a wide variety of fascinating animals and people whilst learning about the various other businesses related disciplines that make up a modern day zoo operation. What does your role entail and what have you changed since you arrived at the zoo? My current role as Director of the Zoo (which I have been doing for the past 7 years) means that I am involved in every aspect of the zoo business, managing my teams from the various departments to ensure that we maintain a safe, enjoyable and profitable site whilst optimising our visitors experience and constantly striving to improve the welfare of our animals, whilst supporting their wild cousins by means of education awareness, captive breeding and In-situ conservation support. As well as running a zoo we also have several periphery businesses on site including a children’s day care nursery and a children’s indoor soft play centre – both of which benefit from being in a fantastic setting and great environment within the zoo grounds. These different aspects of our overall business then assist us by generating additional income and raising the profile of the zoo within the local community. 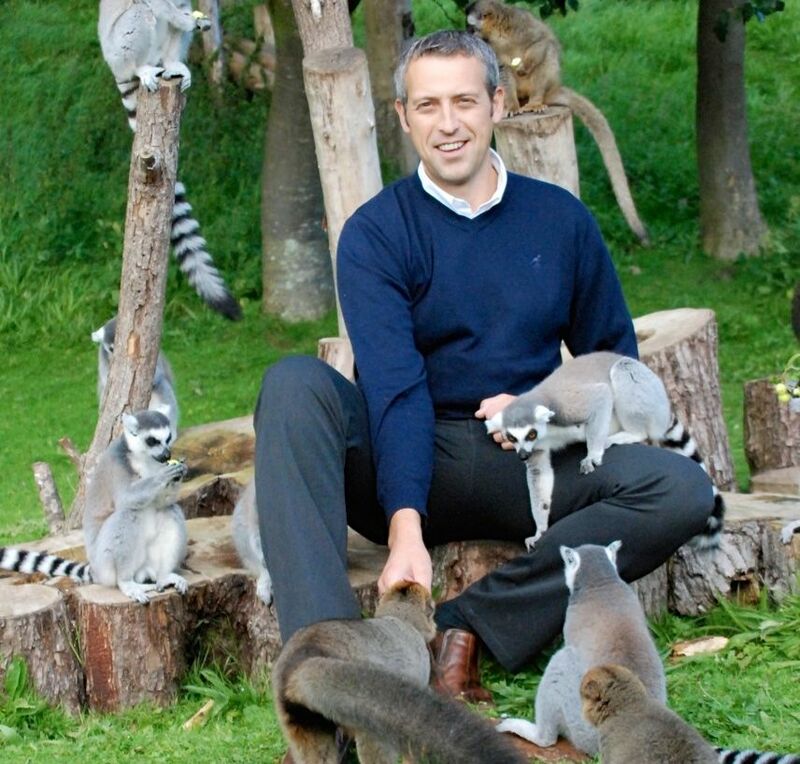 As a Director of any business you have the opportunity to influence all aspects of its development, of which I would like to suggest I have over the years, however of utmost importance to me is that I have managed to give some real consistency to the zoos development, throughout various periods of uncertainty and change. As well as giving consistency I have managed to lead the staff at the park through a shift in their commercial thinking whilst still making sure that we have maintained a key focus on our role within the zoo community and its vitally important work in the fields of animal welfare, Education, Conservation and Research. What is the mission statement of Blackpool Zoo? We aim to provide a stimulating, informative and enjoyable experience, showing visitors our role in the conservation of endangered species through continually developing the highest standards of animal care. You are part of the Parques Reunidos group, based in Spain. Is that recent, and what dynamic does that now bring to the zoo offer as opposed to a council-run operation? No not particularly recent as we have been a part of the Parques Reunidos group since 2007, and previously to this we were under the ownership of another private leisure operator from 2003 (so 10 years in the private sector and 30 years as a local authority run zoo previously). This 10 year period of private ownership has however not surprisingly coincided with the zoos most successful period to date in terms of both visitors and revenues and has seen significant investment with many improvements in the zoos infrastructure, facilities and animal exhibits. With the need to balance being a successful business whilst maintaining our key aims and objectives as a modern day zoo, being part of such a big organisation as Parques Reunidos gives us the umbrella network to pool resources and experience from within the group to the benefit of the zoo, its animals, staff and visitors alike. 2014 will see the completion of the new internal Orang-utan facility (this replaces the old facility which was over 40 years old and an original part of the zoo when it opened in 1972). We are also combining this with a new Children’s play area which will be positioned next to this new animal facility and will allow our visitors to pit their climbing abilities against one of nature’s most impressive arboreal animals. We are also starting the process of designing the future facility for our Asian Elephants which will be another important milestone in our progression as it will again replace/improve on an original part of the zoo and show our long term commitment to this endangered species. In terms of conservation, is there a particular focus of the zoo’s efforts? Apart from the work that we do with the animals in the zoo as part of many European and International breeding programmes we tend to focus on our ‘core in–situ conservation’ projects. Whilst this does not limit us to participating in annual campaigns, such as the ones organised by EAZA (European association of Zoos and Aquaria) where we are always active supporters in generating funds and awareness, we are committed long term to the projects that have an integral part to play in our conservation message that we promote to our visitors on a daily basis. We support the schools awareness programmes that are run by this organisation with the aim of raising awareness amongst the locals to try and limit the tension with issues surrounding the problem of Human v Elephant conflict in many regions of Sri Lanka. We are one of the major supporters of this project through our parent organisation conservation arm – the Parques Reunidos Foundation. The work of this organisation is critical in supporting one of the worlds most endangered marine mammals found only around the coast line of Mauritania. Again a major contributor to this South American conservation project whose aim is to protect and survey the regions of Peru where the endangered San martin Titi monkey is found (one of the worlds most endangered Primates). A very long association with this charity that works to save the critically endangered Tiger species and their habitats. Blackpool Zoo is very proud to be one of the top 6 fundraising institutions for this charity. Inspire them! It worked for me, with one of my earliest boyhood memories being ‘Alfred’ the famous gorilla that was exhibited in Bristol Museum. From that first experience of such an incredible animal I had a fascination with wildlife and would encounter it at every opportunity I had! I believe that a modern day zoo has a far greater ability to inspire than zoos of the past or museums and if we can provide an enjoyable, interesting and educational visit for our visitors then we have the opportunity to leave lasting memories with young and old alike. Whether this memory is of an enjoyable family day out where they appreciate spending time with one another or where they have an opportunity to have a close encounter with one of the planet’s most incredible animals, then we can leave a lasting memory. If we combine the new immersive or interactive exhibits that we are striving to build with the strong educational messages that we portray through our various activities in the park such as Educational talks, displays and special encounters programmes then I am sure that we have a great opportunity to inspire the next generation of animal lovers. Where do you see the zoo in 5 years time? I hope that the zoo continues with its current momentum of growth, increasing its popularity both locally and further afield, continuing to grow year on year in visitors and revenues whilst at the same time having continued to invest in its animals, facilities and staff,. This will undoubtedly have allowed us to further consolidate our existing position within the industry whilst opening up other new and exciting opportunities for future investment and growth. At the same time I hope we have continued to increase our involvement in all Captive breeding and in-situ conservation projects and that we have taken every opportunity to promote the great work that we and other zoos do in protecting some of the planets most endangered species and their habitats.